Trans Am’s brand of future-rock has been of constant interest since the day I first heard it in early 2002. I appreciate their hard-drive rhythms and computerized effects. In fact, before i knew any better, I thought the group was from Germany. Turns out they’re actually from Washington, DC, which is why I also appreciate that they tackle political material in a way that’s direct and clever, but not too clever. 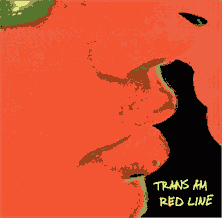 However, I have to take issue with the group’s 2000 album, Red Line. This was indeed the album that started my fascination with the band, but really only on the basis of two very good songs: I Want It All, and Play in the Summer. But after yesterday’s tunequest listen, i have to admit to myself that the rest of the album is fairly uninteresting. I mean, the albums left such an amorphous impression that I can barely remember what it sounded like specifically. I’ll hang on to it though; I never know when it might strike my fancy. Play in the Summer, live in Austin. It’s not as good as the album version, but it gives you a good idea.